Fatty Liver Disease? Never heard of it, well, you aren’t alone. Though one of every four people have it, most have never heard of fatty liver disease and even those who have it may not be aware. The truth is more people have fatty liver disease than those who suffer from arthritis and diabetes as a whole. 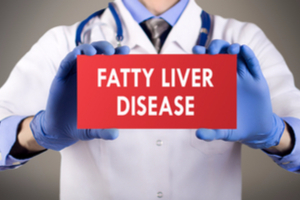 And while fatty liver disease may go undetected, it often leads to serious health issues. The good news is, if you have it, you can reverse it or at least control it. Fatty Liver Disease is simply too much fat built up in the liver. The excess fat has the potential to liver function (filtering toxins from the blood) and so cause those aforementioned serious health issues. Fatty Liver Disease exists in two types: alcoholic fatty liver disease (alcohol steatohepatitis) and nonalcoholic fatty liver disease (NAFLD). Those who drink regularly (one drink a day for women, two drinks a day for men) increase the chances of contracting Alcoholic Fatty Liver Disease. For those who are female or overweight, the chances of developing the disease increase. Heredity can also be a factor. Those who continue drinking after diagnosis may develop cirrhosis, liver cancer, alcoholic hepatitis, or liver failure. Nonalcoholic Fatty Liver Disease (NAFLD), the more common of the two types, is often harmless, though nonalcoholic steatohepatitis (NASH) can occur. With NASH, the liver is swollen, leading to cirrhosis, and increase chances of heart disease and liver cancer. NAFLD is more prevalent in those who are overweight; have high cholesterol and triglyceride levels; have diabetes, high blood pressure, or hepatitis C; or take prescription medications for heart problems or cancer. Typically the disease has no symptoms, thus the number of people who are unaware of its existence. There are cases where the affected individual has pain/pressure centered or to the right of the abdomen. Other symptoms can include fatigue, loss of appetite, and weight loss. Because many patients exhibit no symptoms, the disease can be hard to diagnose. It often requires a combination of blood test to determine liver function, along with a CT or ultrasound, and a liver biopsy to diagnose. Though there is no medication for fatty liver disease, lifestyle changes can help you control it or even eliminate it. Since obesity tends to a be a main cause of NAFLD, developing a healthy weight loss plan and losing only three to five percent of your body weight can make a big difference. Aim for a pound or two per week for best results. Adding activity – like brisk walking for a few hours each week – can also help rid your liver of the excess fat there. Increasing your healthy habits can treat fatty liver disease if you have it and lower your chances of contracting it if you don’t. Eating a nutritious diet filled fruits, vegetables, whole grains, and good fats plus exercising regularly is a great start. Limiting alcohol intake and working alongside your physician to manage your medications and health is important. This means getting treatment for conditions you already have like diabetes and high cholesterol and talk to your doctor about limiting the use of medications that cause liver problems. Talk to your physician about any supplements and vitamins you take to ensure they are healthy for you. Taking care of your liver and your health can also mean inoculation for hepatitis A and B, pneumococcal disease, and the flu for optimal health and wellness.